Photo: Arne Hoel / World Bank. Such threats are often further compounded by a significant lack of state actors’ political will to recognize and protect community tenure rights. Communities and their advocates must often struggle upstream against government reluctance – or outright resistance – to implement national laws and international guidelines that support respect for and protection of indigenous and customary community rights. Often, the most egregious violations happen in nations with the weakest rule of law and the highest disparities between the elite power-holders and the citizenry. Using a single strategy is often not enough to effectively address these interlinked challenges. Advocates often must employ a wide variety of strategies in carefully coordinated unison. Advocates across the world are pioneering new strategies to protect, conserve and safeguard community lands and natural resources, many of which also support communities to leverage the momentum surrounding land protection efforts to create positive intra-community change. To connect practitioners and support sharing of best practices, Namati and Natural Justice convened a symposium of 20 expert advocates from across Africa for a three-day symposium, which resulted in the publication of a book of case studies that highlight advocates’ innovating community land protection efforts. The 18 case studies showcase advocates’ pioneering work, including: how the Zimbabwe Environmental Law Association (ZELA) successfully intervened in the Zimbabwean government’s attempt to forcefully relocate communities affected by diamond mining; how the Land and Equity Movement in Uganda (LEMU) achieved a degree of victory in its effort to support a community to recover its lands from an elite who had used intimidation and litigation to steal once-shared grazing lands; and how the Integrated Rural Development and Nature Conservation (IRDNC) supported the Khwe San community in Namibia to protect their natural resources and train youths to play and indispensible role in the park’s operations when their ancestral lands were turned into a national park. 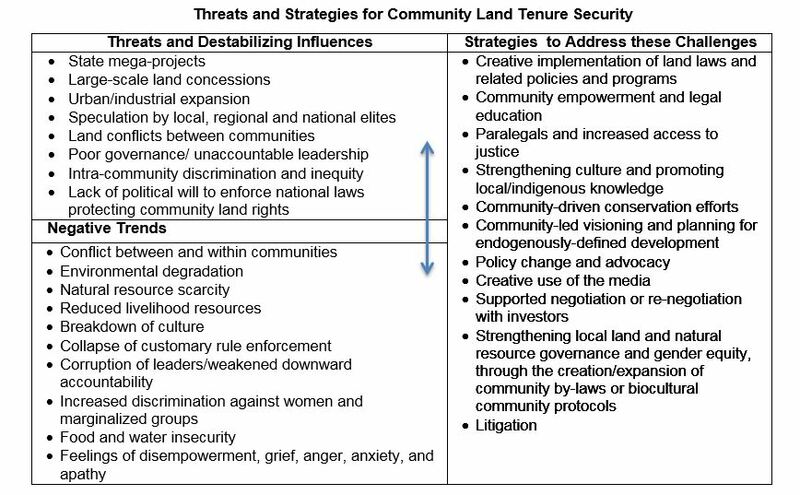 These examples illustrate that when working to protect community land claims, no one strategy will be a “silver bullet.” Rather, as the case studies show, success is often contingent upon often advocates’ ability to leverage of a variety of assets and tactics to address a threat from multiple angles, simultaneously. Involve all community members, recognizing that communities are diverse and that different stakeholder groups may have conflicting interests. Remember that leaders’ interests may differ from community members’ interests; it is necessary to build direct connections with community members – not only leaders – to ensure that continued community support is possible even when leaders act against community interests. Build critical mass around a unified community future vision to challenge outsiders’ “divide and conquer” efforts. Build on community members’ existing expertise and skills and strengthen community capacity to advocate for their land and natural resource rights. Community members are generally “experts” on their lands and natural resources. When formulating an advocacy strategy, advocates should leverage a community’s existing skills, assets, knowledge and resources. Leverage community land protection efforts to strengthen local governance. Drafting and formally adopting community by-laws for good governance and electing a representative, diverse land governing body can significantly strengthen local land and natural resource governance. Ensure that communities understand the benefits and costs of a proposed investment. To ensure that communities make informed decisions about whether to share their lands with an investor, it is important to support communities to understand the socio-economic returns of conserving their natural resources as compared to the promised financial payoff of selling or leasing their land to investors. Leverage the media and use it to ensure that all voices are heard. Target print, radio and social media to spread advocacy and community land protection messages out to the wider region, nation and world. Ensure to include women’s, youth’s and elders’ voices. Link community land protection efforts to wider networks for support by forming strong networks of like-minded organizations and actors (at the local, national and international levels). Front-line advocates around the world urgently need to share their community land protection strategies and learn from one another’s successes and mistakes. The struggles and victories of an individual organization or community can at times feel overshadowed by influential opponents and daunting global trends. But when taken together, individual stories of creativity, unity, courage, and solidarity coalesce into their own trend – a stirring, alternative narrative of hope, justice, and the power of collective action. Read the book: Protecting Community Lands & Resources in Africa: Grassroots Advocates’ Strategies & Lessons. Originally published at The World Bank’s “People, Spaces, Deliberation” blog.